A chain of six stores and warehouses belonging to some of Ghana’s leading film producers, marketers and distributors at the Kejetia Bus Terminal in Kumasi were over the weekend robbed by unknown assailants, Nii Ogbamey Tetteh has gathered. The well organised thieves were said to have even stolen the CCTV cameras fixed in front of the shops to help fight crime. The robbers are reported to have made away with new laptops, mobile phones, security cameras and money worth over millions of Ghana Cedis. According to Michael Kwaku Ola, Public Relations and Welfare Officer for the Film Producers’ Association of Ghana (FIPAG), the robbers broke into one of the shops on Saturday evening and later gained access to the other shops through the ceiling. The Kumasi Metropolitan Assembly (KMA) had earlier barricaded the bus terminal, following a directive to relocate the bus terminal together with shops there. The FIPAG executives visited the bus terminal to commiserate with their affected members on Monday. One of the film distributors told the paper that the robbers broke into his shop and into his safe and made away with money he had made from the sales of movie CDs. Mr Ola added that following the unfortunate incident, the Kejetia Bus Terminal had become a security threat, making it unsafe for anyone to be around the place. “Most of these producers, distributors and marketers also trade in laptops and mobile phones, and all these things were taken away. Even the shops with CCTV cameras, the thieves stole the cameras along with the recordings and everything. 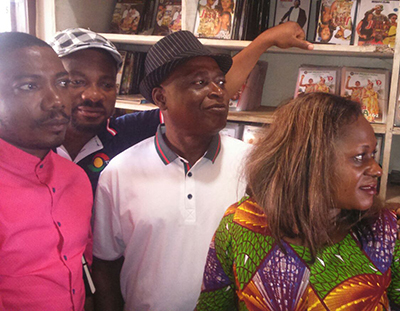 But fortunately, the movie CDs were left untouched,” he said. He pleaded with KMA to relocate the bus terminal along with the shops as soon as possible to avert a recurrence of such an unfortunate incident. Meanwhile the police have since launched a full scale investigation into the robbery.